The Road Transport Department (JPJ) is asking driving schools to absorb the 6% Goods and Services Tax (GST) as a corporate social responsibility to help learners, Bernama reports. “Driving licence and road tax are not imposed with GST, only the services provided by the driving institutes are taxed… so I am urging them to emulate the move by several hypermarkets such as Mydin to help their customers,” said JPJ director-general Datuk Seri Ismail Ahmad. “I hope the 205 driving institutes in the country would heed the call to absorb the tax for the benefit of their customers,” he said. Meanwhile, JPJ is in the final phase of providing test guidebooks in Mandarin and Tamil. The computerised test questions will also be available in Mandarin and Tamil for the benefit of learners not conversant in Malay and English. “It is expected to be ready before the end of this year and the test by then will be available in multiple languages,” Ismail said. In another development, the director-general said JPJ is continuing to monitor all driving schools to ensure they are not involved in Learner licence syndicates, under which applicants can allegedly get an L licence without taking the computerised test. 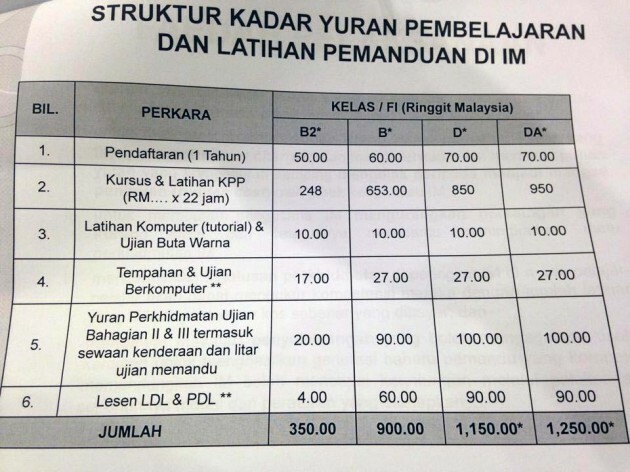 According to the national news agency, it was recently reported that some foreigners were paying RM2,000-2,500 to obtain L licences, for fear of failing the computerised test due to language or literacy problems. The payment would allegedly be handed to a driving school agent or counter staff at the computerised test operating company. “JPJ will cooperate with the Malaysian Anti-Corruption Commission to eradicate such syndicates and if any driving institutes are found involved, we will take appropriate action,” he said. Cannot la. Go and see all the driving schools, ultimately it is owned by the kakak ipar, anak tiri, bapa saudara, abang ipar, abang kepada abang ipar of some JPJ officer. Yes, the are not directly owned by dig deeper and you will see, most driving schools are owned by relatives of JPJ officers. This is all drama by Ismail Ahmad to excite the public and to show JPJ cares. I have a better idea, why not G absorb all GST? How to absorb? It is like using Always or Kotex? I think Always can absorb better! So you are asking the driving schools to make a loss?? I thought you say GST will drive down prices and good for country??? BN supporters will come out and say words like “GST help reduced price”. And why now increase price?? why the logic?? Instead of asking private sector absorb GST, why dont Gov absorb it all by it self? it also social responbilities, Malaysia Got Gold, Silver, Aluminium, Pamp Oil, Rubber, Swiftlet and Agro Products, Singapore got nothing, can you explain how you spends? enough lah G, don’t force rakyat to turn you down. Cant they just make it Zero rated supply? Absorb?? Why don’t the government don’t impose GST in the first place?? Gst is good especially for umno bn cronies because they can make easy money , umno people lazy to work hard cause its a waste of time . This fellar is well-knowned for his stupidity. Every time he’s bombarded with questions, he tends to seek his left or right-hand macai to answer. He’s never able to answer any questions regarding his work. A true example of “gaji buta”. Him being a director-general of JPJ, i felt ashamed. So whatever words comes out of his mouth, i won’t be bothered to listen. I’m still having a little questions to be reconfirmed. 1. The price is 1,150. Okay. Is this still the current price? Because I heard some local friends of mine saying that it’s over 1500 and below 2000. I’m not saying you guys are lying. Because this article might be a little long ago while today’s date is 27 sept 2015. Also the price of these classes are always increasing. 2. Me having a Toyota Rush. Am I suppose to take lessons D or DA*? 3. The language of English. Is it still be available in English as the language of government property is always changing. No offence but it’s true.